The Houston MG Car Club is an affiliate member of the North American MGB Register and the North American MGA Register. Because of this relationship we get several benefits including the ability to secure insurance for the club and our events at no cost to us. We also have the opportunity to vote on the officers of the NAMGBR. But to have this benefit there is a requirement for us to know which members of the Houston MG Car Club are also members of the Registers. We are asking that everyone who is a member of one or both Registers to provide us with your respective membership numbers for each of the registers. This is easy to do. Simply go to your profile page on the Houston MG Car Club website and enter them. The field is near the bottom of the page, below where you enter your vehicle information. And if you are a member of one of the Registers but not a member of Houston MG Car Club, we would love to have you become a member. Simply click on “Join Us” above. Thank you in advance for your timely response to this request. Please be advised that with the functionality of our new website we will soon be closing down our Meetup site. If you have any photo's etc. on the MG Meetup site that you wish to keep, now would be an optimal time to save them to an alternate repository. In the very near future we will be adding the ability to make online payments and hosting an online store for ragalia. Also, as a head's up some of you, well actually a lot of you, may have received to copies of the launch email. Sorry for the inconvenience. Let's attribute it to a rookie webmaster who was a bit over zealous. The two emails are exactly the same. This site is new and we know we don't have it perfect out of the box, if you would like to make suggestions for improvement, please send an email to HoustonMGCarClub@Gmail.com. The Board gives a great big thank you to Mike Woodward and Dwight Dawson for their hard work and dedication to making this new site a reality. We had a great turnout for today's event at Corkscrew BBQ in Spring, TX. We also had the pleasure to meet new club member, Bob Gilbert and his beautiful green 1977 MGB. Many of us arrived early, knowing the reputation of Corkscrew BBQ and how early and long the lines cue up. And they did not disappoint. The brisket was awesome. I also understand a few of our members took advantage of the local shopping in historic downtown Spring. 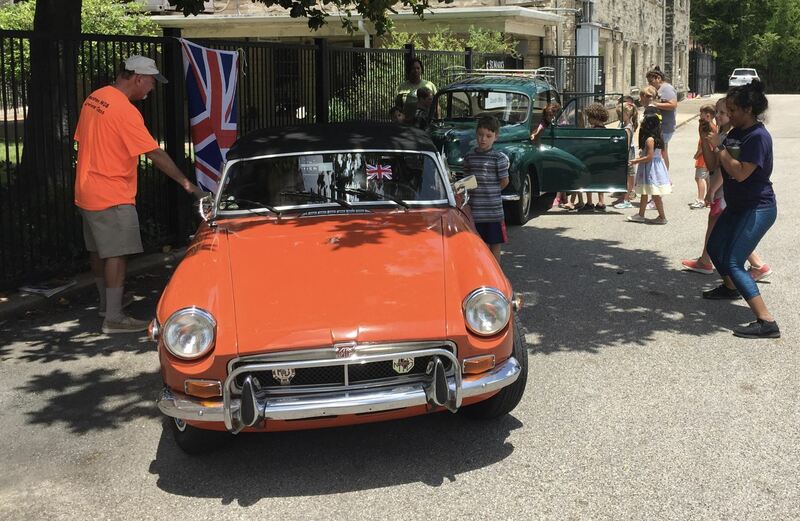 If you haven't been to a recent Houston MG Car Club event recently, we would love to see you join us at our next event. Check out the Events page of the website to learn what is coming up. Mike Woodward and Dwight Dawson delighted 15 or so youngsters appearing at the St. Marks Childrens' Development Center in the Heights. Lots of questions from kids and teachers. Everyone had to sit in the LBCs and they wanted the TOP DOWN on the B despite the 95 degrees of the day. Welcome to the Houston MG Car Clubs new website. We are proud to announce that we now have a modern website which allows for our members and guests to have everything they need to know or do in one place. Event announcements, membership, regalia and news. Even a forum for staying in touch, sharing ideas and expertise. You will be able to register and pay for events online. The best part is that the member contact list will always be up to date and easy to use. Check it out. If you have questions on how to use it, send a note to Bob Chalker.